enaio® seamlessly integrates into your Microsoft-based IT infrastructure and expands it by adding useful features for archiving emails and business documents, document management, mobile working, and much more. In the process, enaio® adapts to your employees’ way of working – not the other way around. OPTIMAL SYSTEMS has been a Microsoft Gold Certified Partner for many years. enaio® seamlessly integrates into any Microsoft environment. Your employees continue to work in the Microsoft environment that is familiar to them. 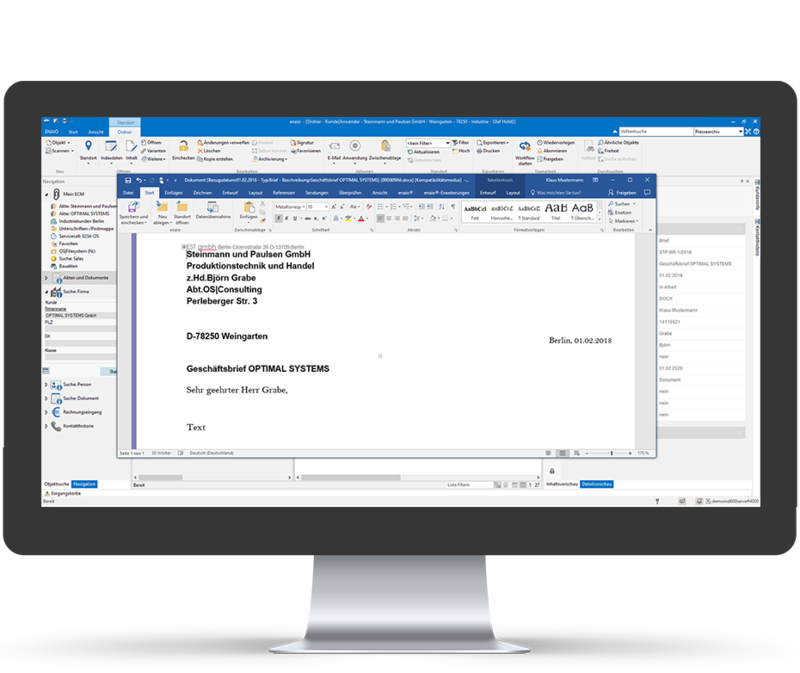 Word and Excel documents can be created, edited, and archived in enaio®. Directly add suitable index data to your Word document to ensure optimal archiving. enaio® is closely linked with Microsoft Office, which allows work processes to be significantly accelerated. 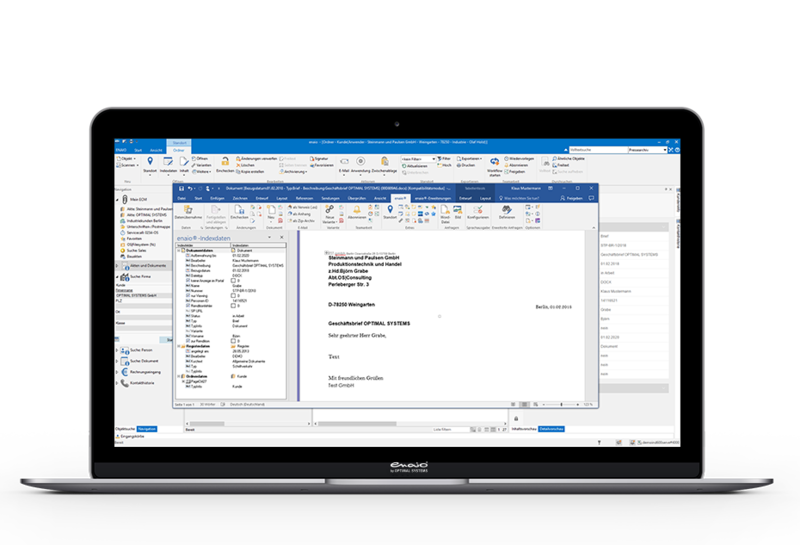 Your employees can directly create, manage, and open Office documents in enaio®, as well as archive them in an audit-proof way in enaio® directly from the Office programs. enaio® provides targeted support to help you keep track of your contacts and e-mails from all places, at all times. Microsoft Outlook integration with Exchange offers a wide range of solutions for optimally interlinking business-relevant e-mails with processes in the company. E-mail management with enaio® goes far beyond audit-proof archiving of e-mails and their attachments: enaio® enables you to carry out comprehensive information lifecycle management that lastingly reduces the workload of your e-mail infrastructure and significantly accelerates work processes. New system, same structure: In order to make it easier for your employees to transition to the enaio® ECM system and prevent the need to re-create existing filing structures, we offer an easy option to transfer existing structures to enaio®. Alternatively, you can simply remain in your familiar Windows work environment and use the various different enaio® features from there. Their integration and automated synchroni­zation of stored favorites make this possible. Automated transfer of index data such as folder/file status, write protection, creation date, etc. We succeeded in boosting the efficiency of our central business processes. At the same time, we were able to improve our ability to provide information to our customers as well as to our suppliers.